During conversations here at AOA and in other venues about the region's cities, very often the focus settles on a question that's more or less: Why can't we have (thing) in Albany/Troy/Schenectady/somewhere? And often (thing) is something along the lines of streetcars, or densely packed blocks of retail, or downtown supermarkets -- the sorts of things that usually require relatively high population density. From 1995 to 2015, development of single family homes across the Region totaled 35,111 units, occupying 55,928 acres. Development in this 20-year period expanded the total acreage consumed by single-family housing in the Region by 38% from levels in 1994. In that same period, the population of the Region grew by roughly 7%. Quite simply, the Region consumed land at almost five and half times the rate of population growth. ... To add even more context on a micro level, from 1995 to 2015, the Region's population increased by roughly 55,000. This means that the Region developed roughly an acre of land for each new person. As population growth continues to slow, and housing construction begins to increase, the disconnect could between the two could become larger. While new housing construction slowed significantly during the Great Recession, it has recovered to a greater degree than population growth. If these trends continue, they could amplify our Region's current pattern of sprawl without growth. This situation is cause for concern because of the expense associated with it. Studies show that low-density development can become very expensive for a municipality. When parcels are spread-out across a large area, it becomes expensive to connect them to utilities and services. In addition, the taxes collected on single family lots often do not cover the expense of servicing them. To compensate for this, many municipalities rely on continual population growth to expand the tax-pool. But, if population growth is slowing, this strategy can become problematic. 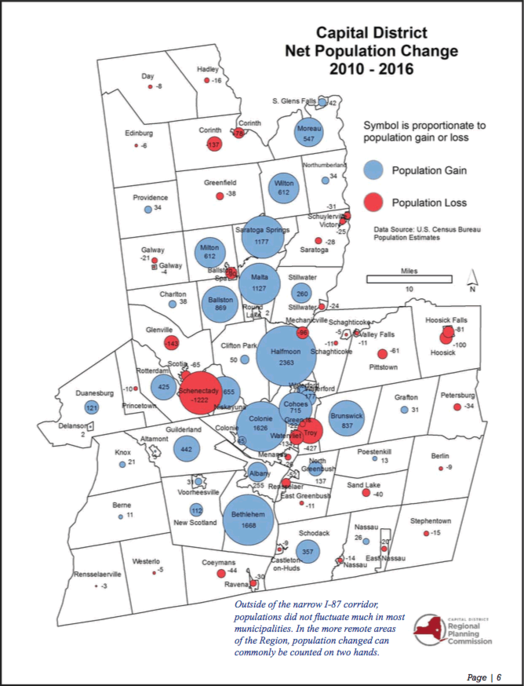 And, of course, this spreading out of the Capital Region's population also takes its toll on the core cities as people and investment empty out of buildings and neighborhoods. One trend that's pushing back in a somewhat different direction has been the big upswing in multi-family housing development in recent years. In 2015, the number of permits issued for multi-family units was more than double that of single-family homes in the Capital Region, according to Census data. And, as Capital Region Data discusses in this same issue, while the different wasn't so stark in 2016, the number of multi-family unit permits again outpaced single-family permits. But these new multi-family units aren't necessarily in the core cities of the region. The top 10 municipalities for multi-family permits between 2017-2016, as tallied from Census data by CDRPC: Saratoga Springs (991), Halfmoon (850), Rotterdam (805), Albany (793), Wilton (695), Bethlehem (647), Colonie (589), Malta (533), Brunswick (512), and Moreau (468). And why is being more spaced out a bad thing? Housing people literally on top of each other is a fairly recent trend. Medieval farmers had to have a dozen of acres of arable land per person just to feed themselves. Most people used to live in very small villages at that time, often on family farms with large areas in between. This is how people lived for thousands years. I've read some studies that big city living induces unnecessary stress on people due to perceived scarcity of resources which negatively impacts health and even fertility. Everyone who ever visited New York City remembers the discomfort. People do want to live further apart if they have a choice and this is exactly what we see. Why not let people live the life they desire? Isn't it what America was built on? When people lament on the loss of manufacturing jobs and (mis)remember the time periods in which those jobs went away, they often tell me about how people moved away because of these lost jobs. Actually, the people didn't really move away. They moved across the city lines over decades of slow, steady trickle. The decline of our cities and the struggles of our region are most closely associated with the lack of land use regulations, encouraging outward development instead of inward growth. A diverse city can weather changes in economic trends. Homogenous communities cannot. Setting purely personal preferences on living density aside - the ratio of tax revenue vs. cost of municipal services is the most concerning aspect to me. What other system relies on a constant influx of new money to move forward? That sounds like a Ponzi scheme. The biggest limitation I see is with the automobile. We can only commute so far from home to work. Lower density housing decreases the availability of plots that will allow a reasonable commute time. Not to mention road capacity. I think we can all agree that the Capital Region has a LOT more traffic than it did 10-15 years ago. We'll have to choose telecommuting, innovate new transportation options, or be forced into higher density housing. Undeveloped land is a finite reason. Sean - high cost is probably more of urbanist wishfull thinking than a real problem. If you look at city of Albany budget, two biggest items are police ($600 per capita) and fire protection ($400, if I remember correctly). Those two eat up 50% of Albany budget. REasons are pretty straightforward - higher crime rate in Albany, and dense and "high rise" buildings being more prone to fire. Look at Albany fire news - row houses burn by a handful when old wiring gets shorted - as opposed to well separated homes on bigger lots. And multifloor structures require more professional firefighters, apparently. At the end of the day things probably balance out, if not better than that. People living on top of each other is not a modern trend as any trip to an old city in Italy/Spain/France/etc. would show (not to mention Istanbul/China/Mexico City/etc. if you are willing to expand beyond European medieval examples). "People do want to live further apart if they have a choice and this is exactly what we see. Why not let people live the life they desire?" - They are more than welcome to, if they are willing to pay the extra amount it costs to extend sewers, roads, telecomm., etc. to more remote places where it is less cost-effective to do so through public means. @ Luâ€”I don't think it's true that people only recently started living in major cities. Just look at ancient Rome, or Alexandria, or Athens or Sparta or any one of the hundreds or major cities in Africa, Asia, and Europe, that have existed since the beginning of civilization as we know it. I would also push back on the idea that people "choose" to live far apart. Sure, some people do. But if the exurbs are the only place where developers build, people can only choose among the houses that developers are making available. Because there is a greater profit margin, developers build on the farthest, cheapest land. If they don't give people the option of dense, walkable communities, you can't say that it is merely a choice. Just think to yourselfâ€”how often do you see new housing going up in downtown areas? Hardly ever, and yet the demand for that housing is high because the homes do not stay on the market for long! Walkable communities are healthier, safer, and better for the environment. They also encourage neighbors to get to know one another (which is sorely needed given our current politics and lack of civic engagement). Indeed, human history has always included walkable, person-sized development, and we should continue to do so. Sprawl is not inevitable. It is a choice, and it is a bad choice. Brian - well said, thanks for correcting the nonsense. Building communities where one doesn't have to get in a car to do everything is key. It's not so much multifamily structures as viable village-like development with sidewalks, bike friendly streets, commercial cores, neighborhood schools and parks, etc. Ballston Spa has many of the ingredients, as do Catskill, Hudson, Pittsfield...and Troy is on the cusp. @Lu -- One other point about medieval farmers -- agriculture was actually organized around the "open field system." Farmers lived in villages surrounded by the fields and they would walk out to their plots to work individually or as families. To imagine many individual farms spread out over the rural landscape is to imagine private property, which was not the norm for tenant farmers at the time. I think a lot of quantitative studies have more or less concluded that sprawl does cost more than density. Obviously, that doesnâ€™t apply to every metropolitan area and it oversimplifies the numbers (a particular expenditure may be costly in most sprawl environments, but not necessarily all, and vice versa), but at a gut level, one would find it a foolâ€™s errand to argue that building and maintaining (emphasis on maintaining) a mansion isnâ€™t more costly than a small, efficient property. At the end, Iâ€™ve provided a link that highlights some of the ratios between development in the suburbs versus the city (use of grain of salt, this analysis is based off of Canada), but those â€œtrueâ€ costs get clouded due to debt-leveraged infrastructure that isnâ€™t tied to a savings plan for future maintenance and invariable support by state and federal taxes that often subsidize development (thank you Senator for building this fancy new building and all the jobs it may bring) and again leave localities holding the maintenance costs (but Senator, can you start escrowing the maintenance costs for us now, so we can draw down from this fund in the future and not have to painfully balance maintenance costs against maintaining services). The biggest issue is that almost all jurisdictions, from the densest to the most rural, rarely account for the future, which I feel has only been exacerbated in the past 30 or 40 years as Americaâ€™s economy has matured and many states and localities are selling away pieces of their future in order to discount current costs for employers or residents. Certainly in our region, you see this most visibly in the cities (or in your pocket book with higher tax rates), due to a lack of foresight by our historic leaders to account and save for the future maintenance costs of what they built. Setting aside the unique and fair argument that the city of Albany is handicapped by only being able to tax a third of its land, Albany over the past 20 or 30 years has witnessed an escalating treadmill of maintenance costs as infrastructure ages past usefulness, while it juggles to provide other services that are often higher than its peers (e.g. policing and firefighting). However, in our neck of the woods, the strain is starting to pinch our older, inner rung suburbs. Colonie defrayed maintenance costs (which continue to escalate), forcing the town to sell off property and privatize its lucrative landfill for short term gain at the expense of long-term security. In East Greenbush, bonds were reduced to junk status, forcing town leaders to get real on the â€œrealâ€ cost of providing services by raising rates on sewers, but may be erasing efforts to right the ship by issuing significant bonds for new sewer infrastructure in the hopes that they can lure development despite the fact that population growth has stalled or may in fact be decreasing. Sadly, the city of Albany has increasingly borrowed some nasty tricks used by the suburbs to â€œkeep taxes down now and worry about maintenance laterâ€ by debt financing more and more infrastructure with no clear pathway to save for its maintenance down the road. Another interesting development Iâ€™ve recently read that loosely ties into this debate is the movement towards owning our energy destiny. As more and more folks rush to solar, wind, geothermal, what have you, this will decrease the number of rate payers in the market, escalating costs for those who opt to stick with their utility companies. It costs more to supply power to those in suburban and rural communities, due to volume of infrastructure required, therefore, this movement may end up spanking suburbanites more as utilities see fewer rate payers but need to maintain the same infrastructure. In the end, our reasons for where we live are complex and varied, but the lack of a true appreciation for what things actually costs, both in the present and to maintain in the future, clouds our judgement too often. This problem isnâ€™t unique to either urban or suburban environment, but again, one will find a hard time arguing that sprawl does cost more, therefore ignorance on the costs associated with sprawl will compound more quickly and will require more pain to remedy. We can go long way figuring out who i spending that extra penny..
Thing is - most shocking thin in this post is how planners look into past, instead of looking into the future.
" along the lines of streetcars, or densely packed blocks of retail, or downtown supermarkets -- the sorts of things that usually require relatively high population density." We don't need blocks of retail - amazon is the name of the game for next decade. We don't need streetcars - those are highly efficient when shifts of workers have to report on time to iron foundries which are long since gone. And while we are at this - no need for many blacksmiths who can fix a loose horseshoe. Rich, I hate to say that- but someone is not checking facts before posting. I hope that was an honest mistake. To be specific: looking at the link you posted: two big ticket items are fire and police, as discussed above. And I have actual real numbers taken from official municipal budgets. Your link shows $200 and $400 per household respectively. Same for firefighters, $400 vs $100 - pretty much opposite to what streetblog says. That alone qualifies that streetblog article as "fake news". But that is the name of the game these days, unfortunately. Rich I think you are overestimating the problem faced by utilities. National Grid still charges you, whether you have solar or not. That's because they own the distribution infrastructure, not the generation infrastructure. They don't generate electricity, they bring it to you. That charge isn't going away any time soon. @Mike, no honest mistake, I was pretty clear up front with some qualifiers that this is based off of Canada, and that comparing jurisdictions can often oversimplify things and doesnâ€™t take into account state and/or regional differences (e.g. in NYS, towns canâ€™t have a professional fire department, only villages and cities, so they have no option but to go volunteer whether for better or worse). Unfortunately, a graphic canâ€™t always tell the whole story, but instead homogenizes it, so you must always take it with a grain of salt (for instance, you have three men in a room, two are blue collar and one is Bill Gates, an average of their salaries would give a truly distorted picture of their annual earnings). However, it can help inform discussion, but will concede that this particular graphic may have muddied the waters, especially since it may not totally relate to our neck of the woods. My bigger point is that we are all guilty of ignoring the true costs of our infrastructure. As an urbanist, I readily admit that us city slickers can be just as ignorant, especially on discounting our future maintenance obligations (Yay, Albany has a Convention Center, but whoâ€™s starting to save for the maintenance costs down the roadâ€¦yes, crickets on that point from our politicians). Additionally, we have so many hands in the pie in terms of funding our infrastructure (e.g. local revenues, county revenues, state support, federal support, grants, special districts, etc.) that we donâ€™t always get an honest picture of what things cost to build and more importantly to maintain (if those maintenance costs are even considered, as I point out is rarely the case). Fake news or not, Iâ€™ll still hedge that sprawl costs more than density, especially when you tally all of the externalities, not just the costs to build and maintain our public infrastructure. @Justine, I more or less agree with you, and donâ€™t believe this shift will be noticeable for decades. However, National Grid cannot charge one if they are completely off the grid. While very few are going off the grid completely (especially if they want to sell energy back, requiring them to remain as part of the energy system), that hasnâ€™t stopped many states from passing laws that make it illegal to cut ties with your utility, with politicians making the claim that utilities will be forced to spread the costs to fewer customers; never mind the fact that government will also lose out on all of those little fees they can charge you on your utility bill, which may be the real reason they have made this practice illegal. So a handpicked location may produce the numbers you like - but numbers may sort of may be possibly be different in situation at hand, heh. As for costs.. Maintaining ancient infrastructure also costs a fortune. Yes, that wasn't planned ahead. ANd yes, many things just at the end of service life. I just happen to know some difference between sewer system in Malta and Albany. That difference is at least 2 generations of technology - and you can smell that difference on Hudson on a rainy day. I am not sure how that would add up in terms of longevity, but I suspect cast iron or lead pipes are no longer used these days... ANd total rebuild of utilities in a city for modern standards is probably impossible, so costs of densely populated areas would only keep growing. But again, I think discussing if I owe you a nickel or you owe me a penny are not that useful when we're talking about planning - which brings to National Grid discussion. Once again, we have a new technology (a lot of them) which changes things. We had similar landline-cell situation... And sky didn't fall on us! Grid may have hard choices to be made regarding capacity, control of both capacity and consumption, change in patterns.. Don't use that 50 year old yardstick for the problem... And THE problem - from my perspective - is that politicians still use that old yardstick... SOmetimes they paint it green, sometimes coal black - but yardstick is still the same.